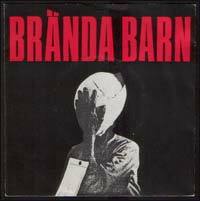 From Sundsvall the home of Massmedia, Vacum etc but suprisingly not released by the famous Massproduktion label. Formed by the Brodin brothers(vocals and drums) togheter with Peter(bas) the singer from The Same whos Kuken i styret was posted before. The title song is a slow creppy number that I’ve learned to like but it’s Andra behov the get’s my head roling. All in all this is the best effort from Brand barn who released two 7inches and one LP. Brodde was one the best lyricist among the swedish punk bands and he’ve also said some classic things like: “Demokratin är så dogmatiskt odemokratisk. Dom måste ju sparka in demokratin i skallen på folk“. Learn swedish goddamit! One of the things I liked most is the incredible ugly guitarist Svensk. Where are all the ugly people in bands now? I hate good looking people it’s not punk. I found their LP about a year ago. I gave it a cursory once-over listening. After hearing this EP I need to break the LP out again and listen a little closer. Well the LP is nothing like this. Too bad this is the only release that rocks. At least in my opinion. Those were the days! We even named our band Andra Behov. Just a little stroll down memory lane!